Crowdcast offers a revolutionary webinar solution, powered by the OpenTok platform from TokBox. "Our partnership with TokBox allowed us to scale with our customers without having to manage a giant engineering team." 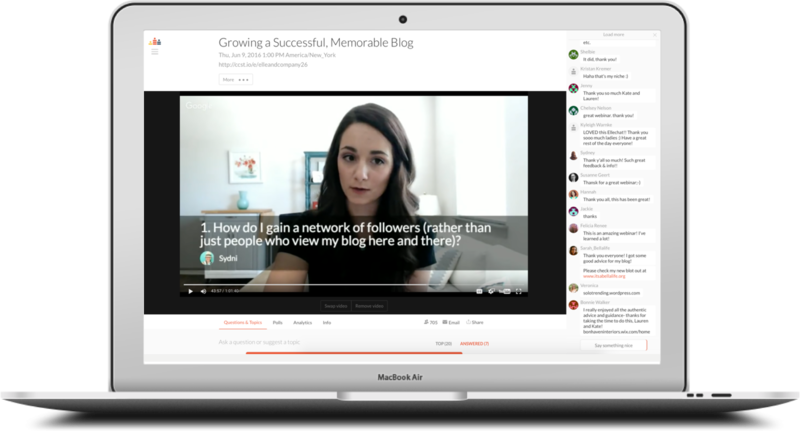 Crowdcast is on a mission to change webinars from being the clunky, frustrating experience of old to being a seamless, delightful way to teach and connect online. Combining a UX that customers love with powerful live video, the Crowdcast platform allows anyone to set up and run professional, high quality webinars, Q&A sessions, live courses and summits with a few easy steps and no downloads. While there are many options available to host and participate in webinars, the experience for both host and audience is often fraught with frustration and technical problems, meaning that time and energy is diverted to fixing tech problems rather than on creating great, engaging experiences. Many webinar options are also just a one way street - a host talking at an audience with little or no options for real interaction that would bring the subject to life. Crowdcast knew that there must be a better way. With a strong belief that live video can be used to connect people in more deep and meaningful ways and that shared learning is essential for progress, they set out to create a new kind of webinar platform which would empower individuals, businesses, teachers and activists to discuss, teach and even sell. With a strong focus on delightful user experience for everyone involved in a webinar, it’s no surprise that Crowdcast is growing and needs a live video technology that can help them achieve their mission of helping people have meaningful live interactions with their audience. Using the OpenTokInteractive Broadcast API, Crowdcast is able to provide a webinar service that reaches a wide range of endpoints and large audience numbers. With a huge capacity of 3000 real-time viewers backed up by unlimited HTTP Live Streaming (HLS) audience numbers, Crowdcast users know that their events will scale with them as they grow. By using the RTMP connection for Facebook and YouTube live streaming, they can reach a wider audience on social networking platforms. TokBox’s mobile SDKs also allowed Crowdcast to create native mobile apps to connect to the live video events in a seamless, easy way from wherever they are. Finally, the archiving feature allows webinars to be recorded in a format that’s instantly available and easy for post-production, so the content created on the platform is highly versatile. By using TokBox’s live video platform, Crowdcast has created a webinar platform like no other. Hosts can create an event with a few clicks, and in no time at all can be broadcasting and interacting in real-time to thousands of people in their audience, as well as reaching millions of new viewers via the RTMP integration. The Interactive Broadcast features enabled by OpenTok mean there is no restriction on creativity for Crowdcast customers. Participants don’t need to download any software and can jump on screen to be part of the conversation at any time, whether from the web browser or their mobile.